Okay, I know what you’re thinking. 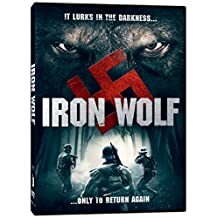 Iron Wolf looks terrible, how can it get a three moustache rating? Well, first, it was terrible. It probably should be about a two, maybe a two and a half, but that’s probably stretching things. It earned three moustaches from me because of the entire movie watching experience. So I did live Tweet the movie… A few days later, the director noticed! Click the various links to see my full thoughts (and jokes) about Iron Wolf! Bottom Line: Iron Wolf has a 2.5/10 rating on IMDb, but director David Brückner’s 2018 film Paranormal Demons has an 8.1/10 rating. I’m not really a big fan of horror, but I’m curious to pick it up and see his craft five years later.